SEO, or Search Engine Optimization, is a method of trying to game search engines in order to raise the impact of your website or post. One of the common ways has traditionally been through the use of keywords. In astronomy a similar method is used to raise the impact of new research. 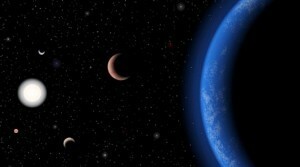 One of the most effective methods is to use the keywords Exoplanet, Earth, and Habitable. If you can add a nice concept sketch of a watery landscape with double suns, that’s good too. It’s no wonder then that news of the discovery of three super Earths in the habitable zone of Gliese 667C was so popular. It’s a type of finding that can get a strong signal over the internet noise. Of course, search optimization is exactly the type of method the researchers needed to do to find the planetary signals in the noise. 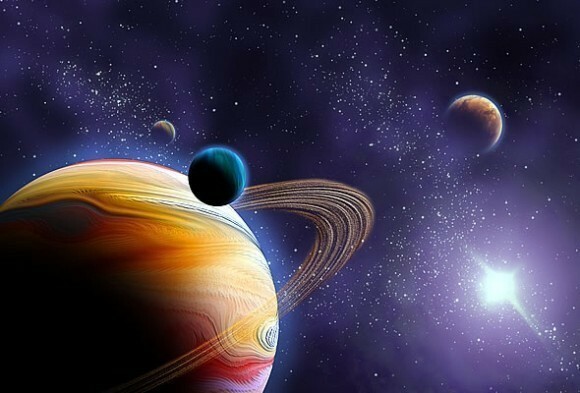 These particular planets were confirmed using a variety of data from multiple sources. They used data from the Very Large Telescope (VLT) in Chile, which is a high resolution visible spectrum telescope, to determine the properties the star Gliese 677C. Since these planets were confirmed using the Doppler motion, they needed to know the star’s precise mass. They then used Doppler data of the star from the Carnegie Planet Finder Spectrograph,, the Keck HIRES spectrograph, and the the High Accuracy Radial velocity Planet Searcher (HARPS). They then had to analyze all this data to find the planetary signals. The basic idea is pretty simple. Since a star and planet gravitationally attract each other, as a planet orbits its star, the star wobbles slightly with the same period as the planet. As the star wobbles, the wavelength (color) of light changes slightly, being blueshifted or redshifted as the star wobbles toward or away from us, which is known as the Doppler shift. By observing the light from a star you can detect its wobble, thus detecting the planet. Credit: Guillem Anglada-Escude’, et al. In practice, it isn’t quite that simple. For one, the Doppler shift is a measure of the motion of the star’s surface, and while a wobble of the star itself is one way for that to occur, other effects such as solar flares can give Doppler effects as well. Then there is the fact that there are likely multiple planets, which means there are multiple wobble effects in your signal. The Doppler measurement only gives us the motion of the star toward and away from us, so if the planetary orbits are at an angle relative to us, the star’s wobble is also at an angle, but we can’t directly see that. Plus the wobbles due to planets are generally quite small, so all the random noise can give the appearance of a planetary signal when there isn’t one. To rule out the false signals you have to test whether the planets you think you’ve found have stable orbits. That means you have to simulate the star system to see if the planets stay in their same general orbit. So to find the planetary signals, you have to do some pretty complex statistical analysis. For example, the figure above is a plot of the Baysean periodograms for the seven planets in the system. Where each of the periodograms has the largest spike is a likely planet, and the larger the spike the more strongly the data confirms the planet. As you can see, the locations of the first six planets are pretty clear. The seventh one is a bit iffy, but the researchers counted it because it is a signal in a stable location for the system. In other words, assuming the other six planets exist, then the orbit of this seventh planet would be stable. If it were in an unstable orbit they wouldn’t have counted it. Once the likely planets are determined, you can then go back and determine things like the shape and inclination of the planetary orbits, as well as their likely masses. These planets are all quite close to their star. Six of them are closer to the star than Mercury is to our Sun. But since Gliese 667C is a red dwarf, the habitable zone is also quite close to the star. The habitable zone of a star is typically taken as the distance range where the temperature of a planet is sufficient for liquid water. This would depend on other factors such as atmospheric density and composition, but for our solar system it spans the range from Venus to Mars, or about 0.7 to 1.4 AU, where 1 AU is the distance of Earth from the Sun. For 667C, the range is from about 0.10 to 0.25 AU, and it turns out that three of the planets fall within that range. These three planets are referred to as “super Earths” because they are more massive than Earth, but not as massive as Uranus and Neptune. The innermost of the three has a mass of about 3.8 Earths, while the outer two have masses of about 2.7 Earths. The Doppler data doesn’t tell us anything about their size or atmospheres. If we assume they are about the same density as Earth, then they would be about 1.5 times larger, or about as much larger than Earth as Earth is to Mars. That doesn’t mean that these planets would be similar to Earth in general. For one thing, the habitable zones of red dwarfs are so close to the star that any planets in the zone would likely be tidally locked. This means they would have one side that always faces the star. If they have a thick atmosphere that might provide a mechanism for heat to be transferred between the near and far sides for a more even temperature, but a thick atmosphere could also trap too much heat (such as Venus) or reflect too much light away. These planets could also experience tidal heating that could cause them to lose much of their water before completely forming. So its very possible that these planets are more like Venus than Earth. But then calling them super Venuses wouldn’t have the same impact factor.